Definition at line 39 of file llassetuploadresponders.h. Definition at line 59 of file llassetuploadresponders.cpp. References LLAssetType::AT_NONE, LLVFS::getExists(), gVFS, llendl, llwarns, mAssetType, mVFileID, and LLUUID::setNull(). 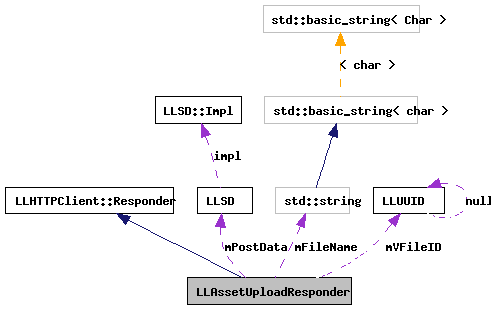 Definition at line 76 of file llassetuploadresponders.cpp. Definition at line 84 of file llassetuploadresponders.cpp. Definition at line 94 of file llassetuploadresponders.cpp. References LLViewerWindow::alertXml(), LLUUID::asString(), gViewerWindow, llendl, llinfos, mFileName, LLUploadDialog::modalUploadFinished(), and mVFileID. Definition at line 119 of file llassetuploadresponders.cpp. References LLSD::asUUID(), gVFS, lldebugs, llendl, mAssetType, mFileName, mVFileID, LLVFS::renameFile(), uploadComplete(), uploadFailure(), and uploadUpload(). Reimplemented in LLNewAgentInventoryResponder, LLUpdateAgentInventoryResponder, LLUpdateTaskInventoryResponder, LLSendPostcardResponder, and LLUserReportScreenshotResponder. Definition at line 174 of file llassetuploadresponders.cpp. Definition at line 157 of file llassetuploadresponders.cpp. References LLViewerWindow::alertXml(), LLSD::asString(), LLUUID::asString(), LLFloaterBuyCurrency::buyCurrency(), LLGlobalEconomy::getPriceUpload(), gGlobalEconomy, gViewerWindow, mFileName, and mVFileID. Definition at line 144 of file llassetuploadresponders.cpp. References mAssetType, mFileName, mVFileID, and LLHTTPClient::postFile(). Definition at line 56 of file llassetuploadresponders.h. Referenced by LLAssetUploadResponder(), result(), and uploadUpload(). Definition at line 57 of file llassetuploadresponders.h. Referenced by error(), result(), uploadFailure(), uploadUpload(), and ~LLAssetUploadResponder(). Definition at line 54 of file llassetuploadresponders.h. Referenced by LLUpdateTaskInventoryResponder::uploadComplete(), LLUpdateAgentInventoryResponder::uploadComplete(), and LLNewAgentInventoryResponder::uploadComplete(). Definition at line 55 of file llassetuploadresponders.h. Referenced by error(), LLAssetUploadResponder(), result(), LLUpdateAgentInventoryResponder::uploadComplete(), uploadFailure(), and uploadUpload().